For builders, providing quality content and visuals on your website has been proven to drive more website traffic and increase visits to model homes. In fact, according to REALTOR.com, listings that include a virtual tour receive 87% more views than those that do not. While great photography helps bring visitors to your site, having quality virtual tours integrated into your site can be even more beneficial than still images. Using these videos to maximize traffic to model homes is very important. Use these best practices for virtual tours to attract more potential home buyers and sell more homes. Focus your tour on positive amenities: Start your tour with the most impressive parts of the home. This will entice the viewer to continue watching the video and create excitement about the home. Avoid negatives about the home such as small backyards and any background visuals of unfinished homes. The goal is to promote the great amenities that your home offers that others do not. Examples of things to emphasize would be cathedral ceilings, granite kitchen countertops or amazing bathrooms. Use quality, descriptive content in the virtual tour: Visuals are great eye catchers, but the content to back the images up is just as important. Explain the image they are seeing in descriptive terms using enticing wording. Explain that those cabinets are made of mahogany wood. Focus the description on the positives mentioned above. Going into detail about the amenities can be the difference between choosing your company or another builder. Have furniture and decoration to create depth: When looking at images, it can be difficult to gauge the depth of a room. Adding attractive furniture without cluttering the home will help the viewer understand that the room they are looking at is actually quite large. This is especially important in open concept homes where it can be difficult to determine the change from one room to another. Be sure to add pieces that have height to emphasize tall ceilings. Include area images and content: When potential buyers are looking to buy a home, they are not just looking for a house; they are looking for a community to call home. Including images of community amenities like pools, sport courts and gyms are recommended. If the area has excellent parks or something exciting, include those images as well. Describing these amenities in a persuasive way is key to gaining the buyer. Be sure to exclude any downsides like traffic near the community or dilapidated buildings near the community. Make your virtual tour social friendly: Buying a home is an exciting experience for anyone. Many look to friends and family while going through this process and sharing possible homes via social media is very popular. Making your videos social friendly by adding easy share buttons to the page will help gain exposure for your homes to more potential future buyers. Be sure to have all the major social media channels that work for your company listed. We recommend Facebook, Twitter, Pinterest and LinkedIn at a minimum. By implementing these best practices into your virtual tours, your homes can gain exposure and attract more on-site visitors. These simple steps can be the difference between a sale or a pass-over within the first seconds of seeing the home. Happy virtual touring! 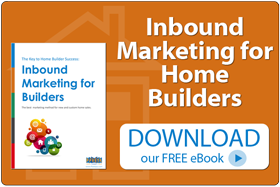 This entry was posted in Blog, Builders & New Home Marketing, Content Marketing, Internet Marketing, Small Business Marketing, Uncategorized, Video Mobile Marketing, Video Web Design. Bookmark the permalink.